“My inspiration for this gyGYPSYpsy wedding shoot comes from Margherita Missoni’s wedding. I love the rural and bucolic location, with poor but coloured details. Simplicity and colours are the only words you have to use by creating a gipsy wedding. The place in which we arranged the shooting was a small country house located in the center of Italy, its name was “casa azzurra” and it was a peaceful place in which you could discover your soul. I think that this styled shoot is perfect for the couple who loves colors and contacting with nature. When I think of a traditional gypsy wedding the colours that spring to my mind are always so vibrant and beautiful! Draw on bright and bold hues when picking your colour scheme to create a similar style to this shoot, the main tones I would pick are reds, pinks, yellows and maybe even a splash of purple or blue! Gather plenty of ribbon to decorate the chairs like you can see here and use colourful glasses, lanterns and even flowers to style up the table! You may even want to get your hands on a bold table runner to tie all of the colours together. 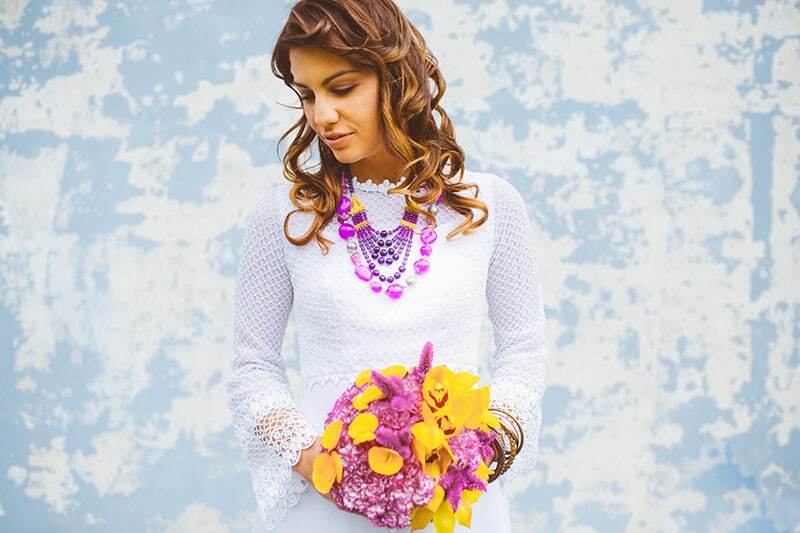 Finally, you’ll want a beautiful chunky statement necklace to add that pop of your colour to your outfit complete with a bunch of bold blooms in your bouquet!